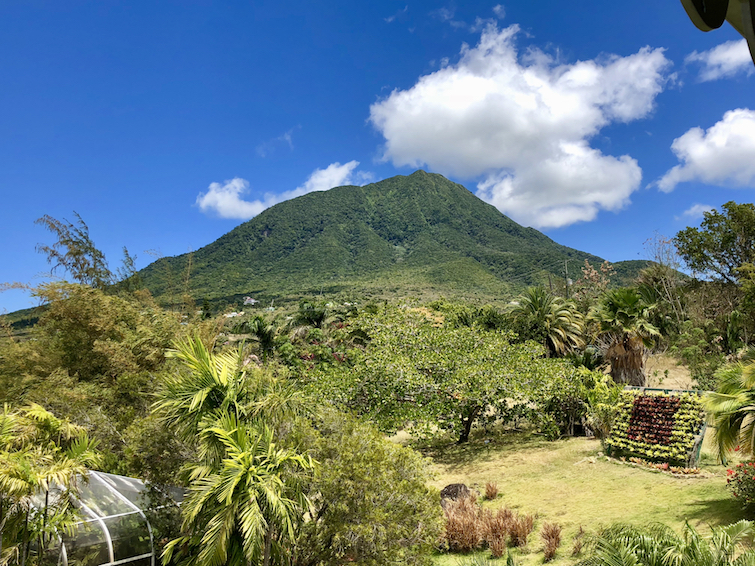 Top 10 Things To Do In Nevis - Caribbean & Co.
Nevis, part of the St Kitts & Nevis Federation is one of the more charming and unspoiled islands in the Caribbean. Its relaxed atmosphere and lush green landscape make it ideal for outdoor and nature lovers; also those who want to experience a Caribbean destination that is not over-developed and showcases its rich history. With that in mind, below are my top ten things to do in Nevis named by Christopher Columbus in 1493 after he spotted the island on his second voyage to the Caribbean. Columbus named the island Nevis as clouds were encircling the tallest peak, Mount Nevis and he thought of the phrase “Nuestro Senora de las Nieves” which means “Our Lady of the Snows.” Thankfully, it does not snow on Nevis where average daily temperature during the winter months is 81°F (27°C), while summer temperatures average soar to 86°F (30°C). 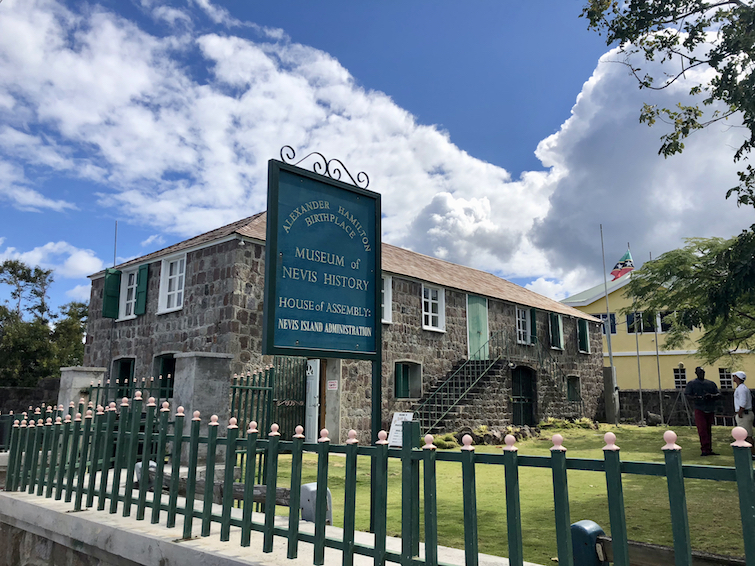 With the raging success of Broadway’s hit musical Hamilton, the Museum of Nevis History is a must visit while in Nevis as it is housed on the first floor of the two-story Georgian style building where Alexander Hamilton was born in 1757. There you will find an exhibit titled “Alexander Hamilton: The Man Who Made Modern America.” The exhibit is small but impressive and details Hamilton’s humble beginnings in Nevis to eventually becoming one of the Founding Fathers and First Secretary of the United States Treasury. Other exhibits at the Museum of Nevis History located near Charlestown Harbour include a timeline history of Nevis compared to the rest of the world. There is also a display of the first people on Nevis and another related to the early sugar production and plantations that came to dominate the island and region in wealth and stature. Finally, there is another on the African influences to people and culture as well as one detailing the Jewish connections on Nevis. Nevis: Museum of Nevis History, Alexander Hamilton House. After leaving Hamilton House, walk or drive into Charlestown. Founded circa 1600, Charlestown is the capital and commercial hub of Nevis. The area is quite compact, so it’s easy to do a walking tour to marvel at the architecturally significant buildings and historical sites. Beyond the Alexander Hamilton Museum, three Caribbean Georgian buildings of note in Charlestown include the A.L. Evelyn Building (built 1837), Longstone Building (built 1820) and Nevis Courthouse & Library (built 1825) which is at the far end of Charlestown Memorial Square. Beyond the buildings are historical sites like the Nevis Slave Market where enslaved Africans were sold to plantation owners from various islands. Also the Jewish Cemetry one of the oldest established cemeteries in the Caribbean with graves dating back to 1679. 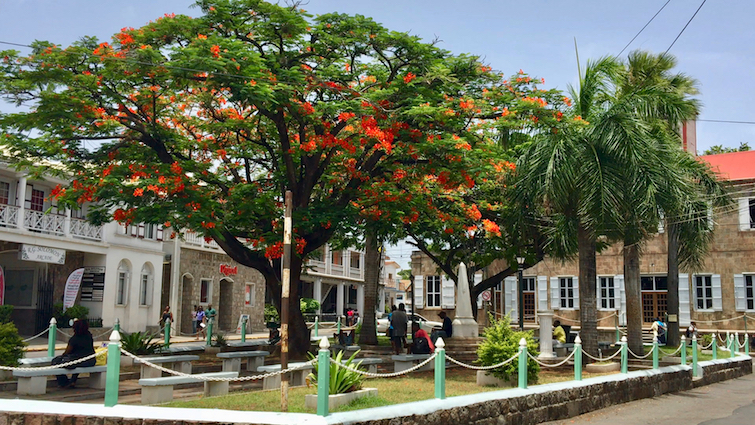 Charlestown Memorial Square in Nevis. During the late 17th century, Nevis was the richest of the British Leeward Islands due to the quality of its sugar cane and the superiority of its sugar production. In fact, it had many sugar plantations spread across the 36 square miles island, including New River Estates which now lays in ruin. Despite this, New River Estates which was the last sugar mill to commercially produce sugar on Nevis is still a top tourist attraction as you can view the original towering sugar mill and many of the large machinery used to create fortunes for British slave owners. These include the steam driven cane crushers and huge bowls called coppers used for boiling the juice from sugarcane. Another reason to visit is that on clear days you can also see across to uninhabited Redonda and Montserrat still recovering from volcanic eruption over 20 years ago. While New River Estate and nearby Coconut Walk Estate both lay in ruin, a few of the historically significant sugar plantations like Nisbet Plantation which was the home of Frances “Fanny” Nisbet who married Horatio Nelson in 1787 have been beautifully restored into boutique hotels. So if you are not staying at the Nisbet Plantation Beach Hotel or Montpelier Plantation & Beach and Golden Rock Plantation Inn, these are great places to go for a delicious lunch or dinner and marvel at the beautiful decor in these former sugar plantation buildings along with their impressive grounds. The Botanic Gardens of Nevis is a great place to spend a morning or afternoon marveling at the hundreds of colorful tropical plants, flowers, and palm trees from across the globe. There are seven gardens including the Herb Garden, Orchid Garden, Palm Garden, Tropical Fruit Garden, Cactus Garden, Bamboo Garden, and Aromatherapy Garden. There is also a range of beautiful water features including ponds, pools, dolphin fountains and historic copper kettles previously used on sugar plantations but now filled with water and plants. Finally, there are about 14 Asian sculptures and a Rainforest Conservatory with three Amazonian green parrots who are sometimes quite chatty. 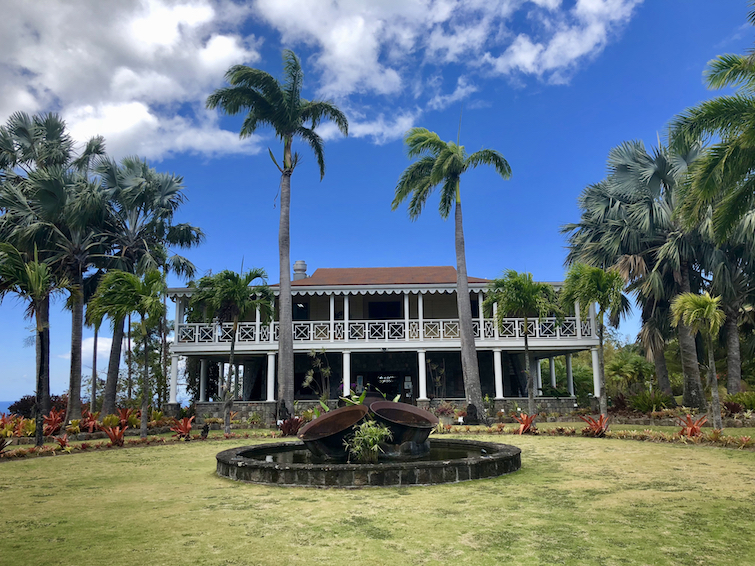 To top it off, visitors can take in the fantastic views of the Botanic Garden and Mount Nevis while enjoying some food and drinks in the Thai restaurant on the second floor of the Nevisian Great House. Be sure to try the blue lemonade drink! Great house at Botanical Garden of Nevis. 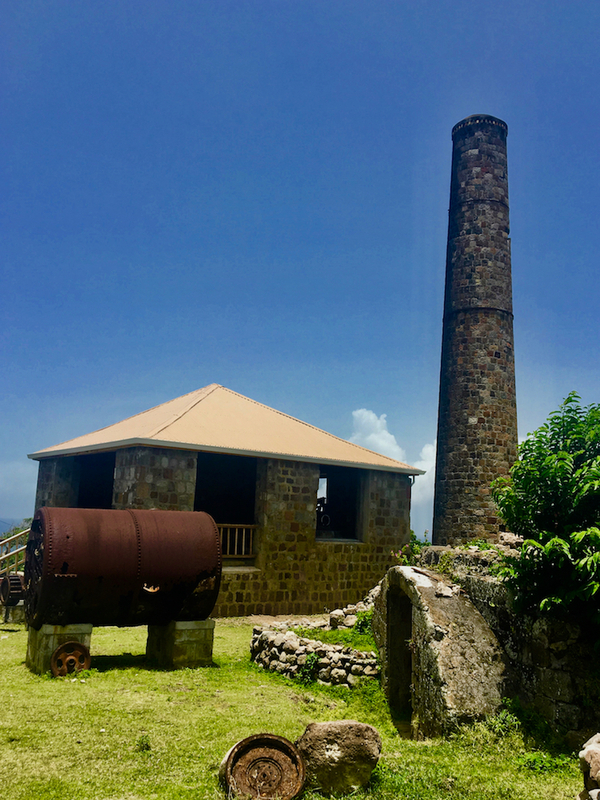 No visit to Nevis is complete without spending a few hours at the Nevisian Heritage Village located on former sugar plantation Forthergills Estates. Why? Well, it is an open-air museum which showcases the evolution of Nevisian social history through its housing. Replica houses are on display starting with the open thatched huts used by Carib Indians who were the original inhabitants of the island. Then one, two and three room Chattel Houses some with outhouses that represent the homes of African slaves and their descendants post-emancipation. These wooden houses some with back gardens are filled with artifacts that stay faithful to their era. Modern-day housing is represented by looking up to the hills, really the lower slopes of Mount Nevis with large brick/concrete houses. 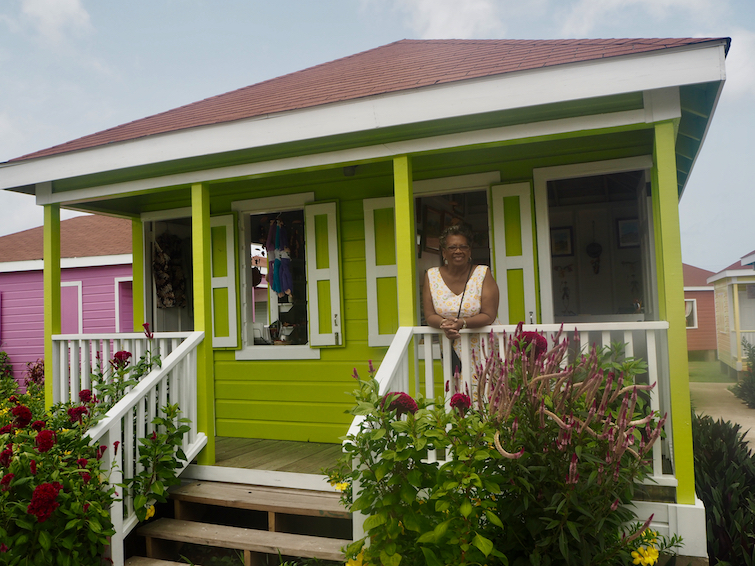 There is also a replica blacksmith shop, rum shop, stove oven and box hut at Nevisian Heritage Village all of which come to live with passionate storytelling by caretaker Patricia Thompson. 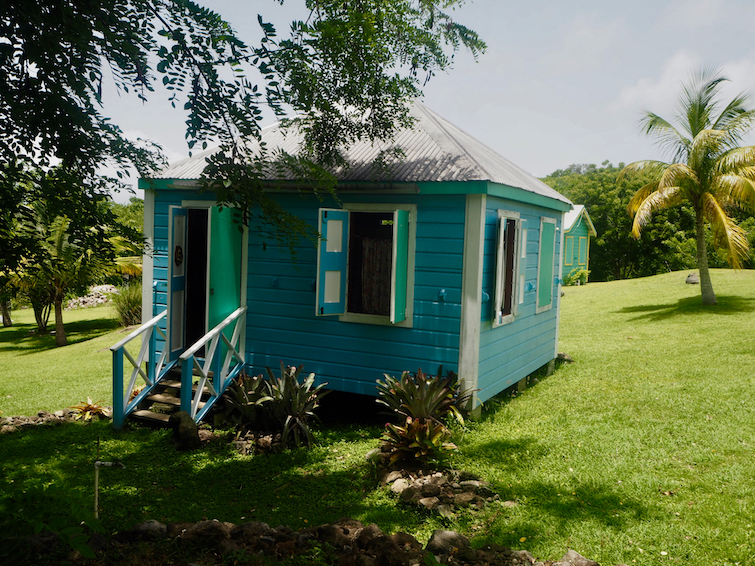 Chattel house at Nevisian Heritage Village. With a population of around 12,000 people, Nevis has about 50 churches and quite a few have historical significance. Two of note include St. Thomas’ Anglican Church and Cottle Church. 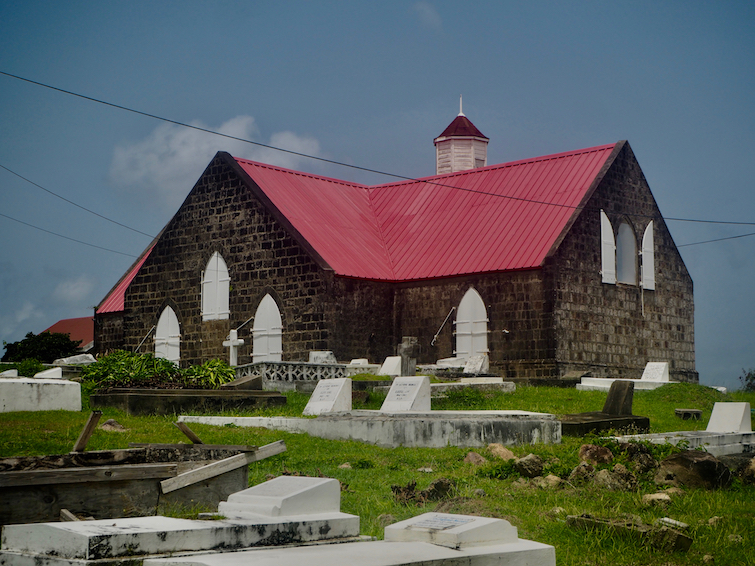 Built in 1643, St Thomas’ Anglican Church is perched on a hill on the outskirts of Charlestown overlooking St Kitts. Still, with a flourishing parish and school, it holds the distinction of being the first Anglican Church in the Caribbean and the oldest church on Nevis. Cottle Church built in 1824 by John Cottle once the President of Nevis was the first church in the Caribbean were African slaves could freely worship. Sadly, Cottle Church hidden in the woods off the main road, just south of the Newcastle Airport is now in ruins due to 1974 earthquake and 1989 Hurricane Hugo, but it’s a popular site for none traditional weddings. St Thomas Anglican Church in Nevis. No visit to a Caribbean destination is complete without a day or two a the beach. And across Nevis, there are about ten beaches within inviting names like Gallows Bay, Oualie Beach, Paradise Beach and Lovers Beach. But one of the more famous beaches on Nevis is Pinney’s Beach which runs for about three miles and is located on the outskirts of Charlestown. At Pinney’s Beach like the others, you can swim and relax on a sun lounger. Or you can enjoy a refreshing drink and meal at one of the five beach bars including Double Deuce, Lime Beach Bar, Weekend, Turtle Time Beach Bar & Grill and Sunshine’s Beach Bar & Grill which serves up a delicious and famous Killer Bee rum punch. Topped with nutmeg, the flavourful Killer Bee rum punch whose recipe is only known to Sunshine who owns the bar is an absolute must when visiting Pinney’s Beach. 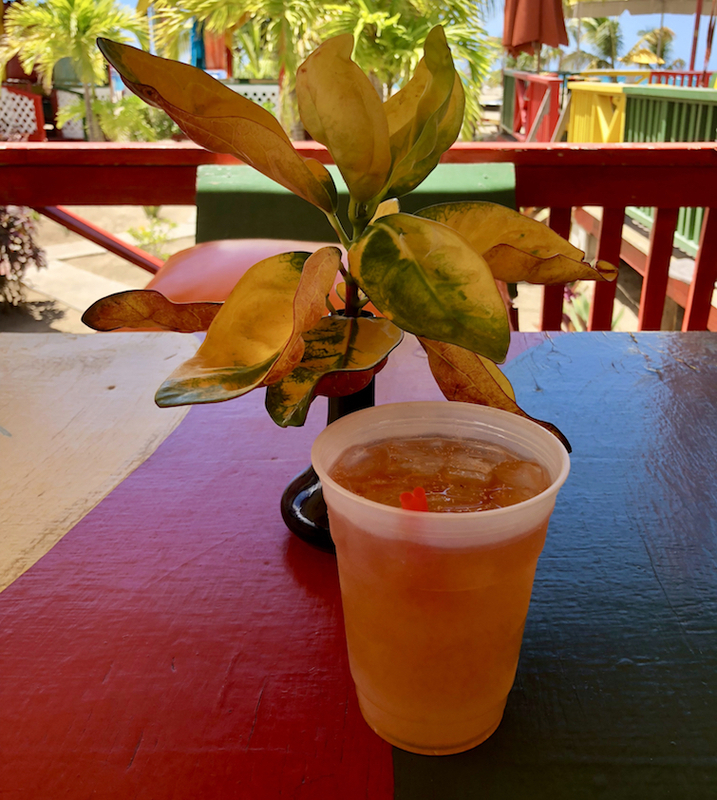 Killer Bee Rum Punch from Sunshine’s Beach Bar in Nevis. At 3,232 feet high, Mount Nevis provides a challenge for experienced hikers. And in that parts of the trail are practically vertical which require ropes to hoist yourself up, it is best to go with an experienced local guide especially if there have been recent rains which will make the trail muddy and a bit more precarious. Views from the top are often cloudy, so hiking Mount Nevis referred to as “The Trial” by locals, is more often about exploring the forest and the sense of accomplishment than seeing spectacular views once you summit. Mount Nevis from the Botanical Garden of Nevis. The thermal therapeutic hot springs in the Charlestown area of Nevis was originally made famous by rich and royal visitors to the nearby Bath Hotel built in 1778 by African slaves for John Huggins, a merchant, and an aristocrat. The large massive stone building was the first spa hotel in the world and incorporated the thermal mineral springs that flow in situ. 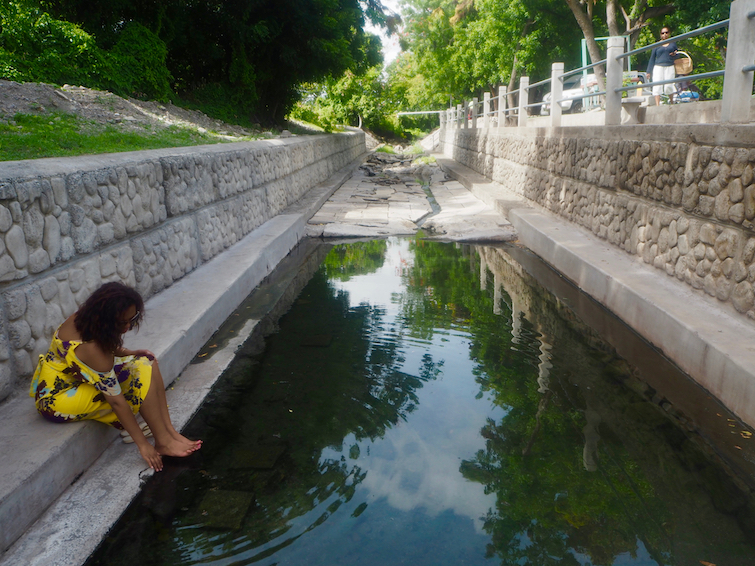 While the Bath Hotel is no longer open, visitors to Nevis can still take a bath or wet their feet in the free-flowing thermal stream. The spring water apparently contains minerals of medicinal value and can help relieve the symptoms of chronic rheumatism and gout. Nevis: Thermal Therapeutic Hot Springs. The Artisan Village Craft House located on the outskirts of Charlestown next to the Nevis Craft House at Pinney’s is the place to go to purchase local handicraft and souvenirs from the island. There’ll you’ll find a rainbow of about 20 colored Chattel Houses with local arts and crafts business owners selling a range of items including handmade jewelry, ornaments, dolls in national dress, clothing, leather goods and painted artwork for local and regional artists. Nevis: Artisan Village Craft House chattel houses. 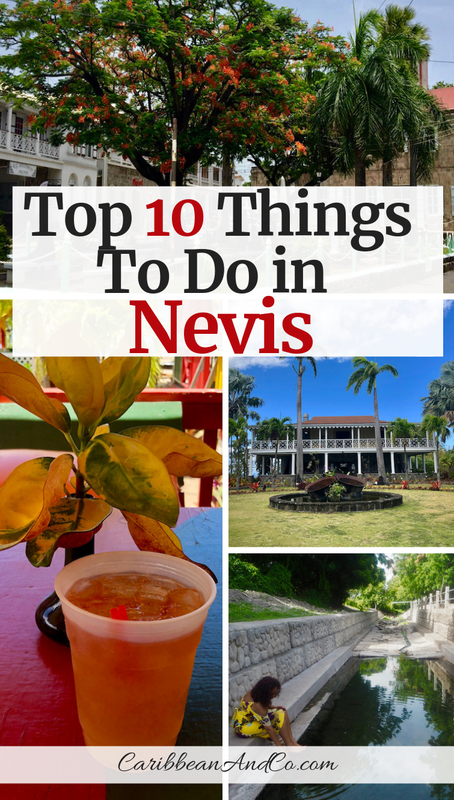 It should be noted that some of these tourist attractions are featured on the Nevis Heritage Trail which was set up in 2003 by the Nevis Historical & Conservation Society. In total, twenty-five historically significant sites including churches, sugar estates, military installations, and natural sites make up the Nevis Heritage Trail. These are easy to spot as you walk, cycle or drive around Nevis as in front of each is a blue and green sign with a walking monkey. Below each sign is a write-up of why the site is historically significant to Nevis. For flight and hotel deals to the beautiful island of Nevis and the rest of the Caribbean, check out our Caribbean travel partner, Expedia.com. Note that to get to Nevis from North America, you’ll need to fly to San Juan, Puerto Rico and then take a direct flight to Nevis. For the UK and North America, you can fly to St Kitts and then take a ferry (45 minutes) or water taxi (10 minutes) to Nevis.